The UK produces less than two-thirds of the food that we eat in a year. Another way of absorbing that fact is this: if all the food produced in the UK was stored in one single giant cupboard and on New Years Day we had all started eating only from that cupboard, the cupboard would be completely bare by August 14th. The situation is getting worse. Our percentage of food self-reliance has been falling steadily year on year. Fifteen years ago, for example, our hypothetical cupboard of home-produced food would have lasted until October 1st. And yet we do not need to import all of the food we currently do import. In making that statement I am not advocating an unenlightened return to austere times (the present UK government is already doing that, thank you very much). I welcome the diversity that imported foodstuffs bring to our diet in the form of produce we cannot easily grow here, things such as avocados, pomegranates, rice, lemons, pistachios, Middle Eastern and Asian spices (to name but a few of my favourite things). However, I do think we can learn lessons from the past, and in particular from the austerity-driven but remarkably successful “Dig for Victory” campaign during the Second World War. “Dig for Victory” was a response to the German U-Boat blockade of ships bringing food to British ports. We needed to find an alternative food source, and that was when this brilliant campaign was born. As well as encouraging citizens to dig up gardens, parks, factory courtyards and common land to plant vegetables and fruit, the campaign also promoted recycling, sustainable land management, organic practices, the use of fresh seasonal local produce, an active life, a healthy diet and a wider spread of knowledge about food, diet and basic growing techniques. Sadly, much of the good of the “Dig for Victory” campaign was lost after the end of the war, and particular after the end of rationing. In a backlash against austerity, and probably fuelled in part by romantic Hollywood-driven visions of a new, modern way of life, there followed a huge rise in consumerism in the UK. Ever since, our consumption of food has become less and less about appreciating and enjoying the riches the Earth provides and more and more about refuelling and over-gratification. We have never recovered, and along the way have become increasingly disconnected from the food we eat and the route that it takes to reach our plates. OK, time to put on the stripey apron and move on to a recipe which, unusually for me, has just four ingredients. Look closely at any allotment plot and the chances are high that somewhere on it you will find a clump or two of rhubarb. High in vitamins A, C and K and with traces of calcium, potassium and manganese, rhubarb was for centuries cultivated for its medicinal qualities – in particular for use as a laxative and an astringent – long before its culinary use. Rhubarb is a rather unusual fruit, not least because botanically speaking it isn’t a fruit at all but a vegetable (it is actually a distant relative of buckwheat). Its designation as a fruit comes from a ruling by a US Customs court sitting in Buffalo, New York in 1947 over a dispute concerning the level of tax payable on imported rhubarb (US tariffs at the time being higher for vegetables than for fruit). At its best, when treated with kindness and a little love in the kitchen, rhubarb is a delight, certainly a far more enticing proposition at this time of year than the insipid, air-mile-heavy imported fruit brought in by the supermarkets. One of the first tasks of my allotment year is to “force” some of my rhubarb. This means depriving it of light, which encourages the plant to send out long, pink, sweet stems that can be harvested early, filling the void in early spring before our more conventional fruit comes into season. Try it in this simple but rewarding granita recipe, where the sugar content has been kept low so that the subtle flavours shine through. The result is a truly refreshing, delicately scented delight. Keep it in the freezer to enjoy in the garden on a warm spring or early summer afternoon, or serve it during a dinner party as a palate-cleansing amuse bouche between the main and dessert courses. 1. Bruise the lemon grass stalks by pressing down on them with a large flat bladed knife until you hear a satisfying crack. 2. Pour the water into a pan over a low heat and add the sugar. Stir until the sugar has dissolved then add the lemon grass stalks and increase the heat to medium. Once it comes to the boil, reduce to a simmer, cover the pan and cook for a further 5 minutes. Remove from the heat and allow to cool for 30 minutes so that the lemongrass has time to infuse. 3. Add the rhubarb to the lemongrass syrup and over a gentle heat bring the pan to a gentle boil, stirring to ensure the rhubarb is ciooked evenly. Turn the heat down to a simmer and leave for three minutes. Remove from the heat and leave to steep for ten minutes, then strain through a fine sieve into a bowl or jug. 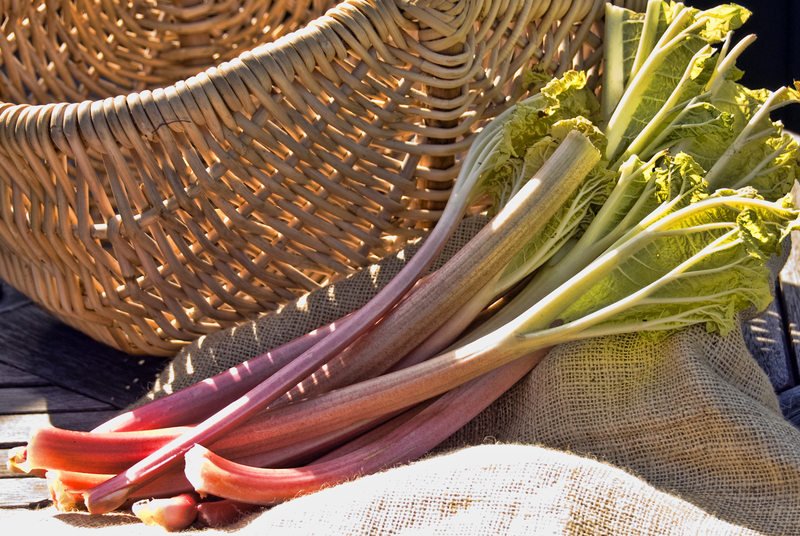 Discard the lemongrass but retain the scented rhubarb for use in a crumble, pie or fool. 4. Allow the liquid to cool completely then put in the refrigerator for 30 minutes to chill. Finally, place in a freezer proof container and freeze. Remove it from the freezer after about two hour to stir it with a fork to break up the larger ice crystals, and do so again after a further two hours. Each time, replace the container lid and put back in the freezer. 6. Before serving, remove the granita from the freezer and place it in the the fridge for 15 minutes. Give it a good stir with a fork to break up any larger ice crystals before serving in individual shot glasses. oooooooh rhubarb, my all time fave. This sounds so refreshing and tasty!